Ask RP Photonics for advice concerning any type of parametric amplifier system. Refined software and an extensive know-how is available to support the development of such systems. The parametric gain within a single pass through a nonlinear crystal can be many tens of decibels, so that OPCPA systems require fewer amplification stages (often just one), usually do not involve complicated multipass geometries, and can thus be built with much simpler and more compact setups. With optimized phase-matching conditions, the gain bandwidth can be very large, allowing very short (few-femtosecond) high-energy pulses to be generated. Thermal effects in the amplifier crystal, such as thermal lensing, are much weaker than in a laser amplifier, since there is only a small amount of heating due to weak parasitic absorption. 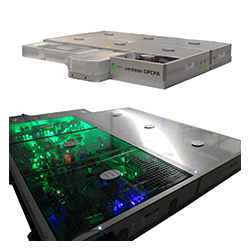 This together with the very high quantum efficiency allows for scaling to very high energy and peak power levels, and also to a high beam quality of the amplified pulses. Sometimes the generated idler wave can also be used. As the parametric gain occurs only within the duration of the pump pulse, one avoids the problems of power losses by amplified spontaneous emission in high-gain laser amplifiers and can easily generate high-energy pulses with very high intensity contrast, i.e. with a very low level of power before the actual pulse. Some large laser facilities, which originally started with more traditional chirped-pulse amplification, have adopted the OPCPA technique for achieving extremely high peak powers [6, 7, 14–16]. Such systems employ at least two amplification stages, with a preamplifier typically based on a borate crystal (BBO or LBO), whereas KDP is used for the final amplifier stage because of the possibility to fabricate KDP crystals with very large useful apertures. A titanium-sapphire laser can serve as the seed source, and high-energy frequency-doubled Q-switched lasers generate the pump pulses. In some cases, a laser amplifier (with moderate gain) is used for the last amplifier stage, but all-parametric systems are also under investigation. The latter already reach peak powers of hundreds of terawatts , and it is expected that multi-petawatt peak powers will be reached soon. The largest amplification bandwidth can be reached with certain noncollinear phase-matching schemes, based on, e.g., a BBO amplifier crystal pumped with few-picosecond pulses from a frequency-doubled mode-locked titanium–sapphire laser. The term noncollinear optical parametric amplifier (NOPA) has been coined. Compared with the above-mentioned high-energy systems, NOPAs typically operate with a relatively short interaction length, much shorter pump pulses and correspondingly lower amplified pulse energies, but reach compressed pulse durations in the few-cycle regime down to ≈ 4–5 femtoseconds. For simplicity, the seed pulse can be taken from a supercontinuum derived from the pump laser itself, avoiding the need to synchronize a separate seed laser with the pump laser. A range of interesting concepts are currently being explored in this domain. For example, there is the idea of wideband phase matching (“achromatic phase matching”) by angularly dispersing the signal beam such that each frequency component of the signal is properly phase-matched. Similar effects are achieved with tilting of the pulse fronts in the amplifier crystal (pulse front matched geometry); even in a collinear geometry, this allows for a very large phase-matching bandwidth [2, 5]. Wavelength tuning, which makes such systems very interesting for various scientific applications, is sometimes possible in a relatively wide range. Another important issue is the precise optimization of stretcher/compressor setups . The use of highly nonlinear quasi-phase-matched crystals allows for very high gains with moderate pump pulse energies. Although such systems typically generate pulses with durations of hundreds of femtoseconds and energies of microjoules or up to a few millijoules, these performance values are sufficient for a wide range of applications, and such systems can be made very compact and efficient. TOPTICA’s FemtoFiber dichro midIR generates radiation at 3 μm – 15 μm. Based on difference frequency generation of two optically synchronized laser pulses at tunable wavelengths of 1 – 2 μm a highly stable broadband emission of approximately 400 cm-1 is generated. Here, the output at 1560 nm of an erbium-doped ultrafast fiber laser is superimposed with the long or short wavelength part of a supercontinuum. 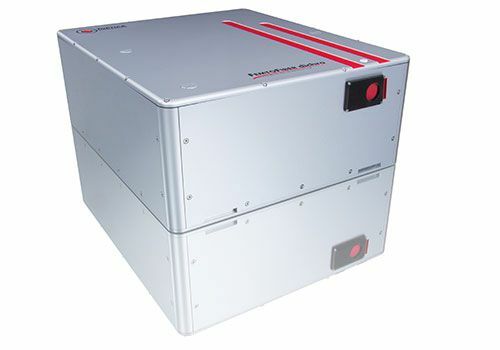 The CEO-free mid-IR laser pulses are applied to attosecond spectroscopy where the extreme UV pulses consist of only a few optical cycles. The conversion of mid-IR radiation to extreme UV is accomplished by high harmonic generation. First, the mid-IR pulses are subject to optical parametric chirped amplification (OPCPA). Then, the intense laser fields are launched into an atomic beam or a gas-filled hollow core fibre to generate extreme UV attosecond laser pulses via high harmonics.